Isn't there suppose to be a difference between the two outcomes? How is that a drawback? @Jojooverdrive, I thought about it for a moment, and then your only source of fap material is anime. Forever. @Jojooverdrive, I’d assume it means you have to constantly watch it, but even then your power allows you to overwrite the necessity of it. This wasn’t very thought out honestly lol. I have anything I want whenever I want. I want the deal to change so I can watch venture brothers and dr who also. It doesn't even say only. I am going to watch anime as long as I live anyway. Now if it's says I cannot do anything else but watch anime I may have to consider it a bit. Still doesn't sound too bad. 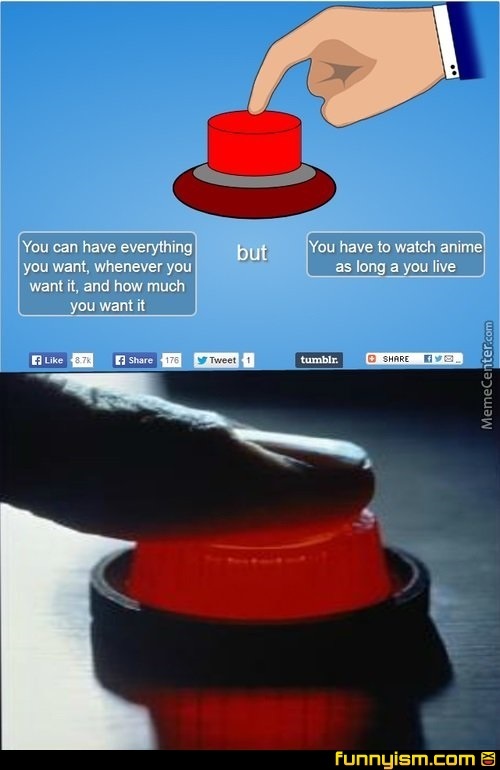 I understood it as anime is constantly playing, 24/7 for the rest of your life. Sure you can do stuff to override it or down it out, but you can never turn it off completely. It's always going to be there... Watching your every move. That's tough. Ooh I got one! "You can have whatever you want, whenever you want but you'll have a spouse that will love you unconditionally and a pupper that will live forever. I don't watch televison anyways. At least I can watch Jojo, Cowboy Bebop and One Punch. I mean you can have it play and multitask. Also even in the event you don’t like anime can’t you just say I don’t want to watch it anymore since you can have anything you want? Some of these are total no brainers.